Today marks a big milestone for pakos.me! It is my 500th post. Yah for me! I should get to 1000 faster now that I’m doing the postaday challenge. A few small statistics for you statisticians that come to my site. Just in case you were wondering how many statisticians check out my site regularily? 9.7623 on average per day, with a standard deviation of +/- 9.7623 , 100% of the time. I have been blogging now for 4 years. That averages out to a post every 3 days! Wow. It has never seemed that consistent! I have taken some larger breaks in there too. To celebrate this milestone, I have a giveaway for you, my 2 loyal visitors! 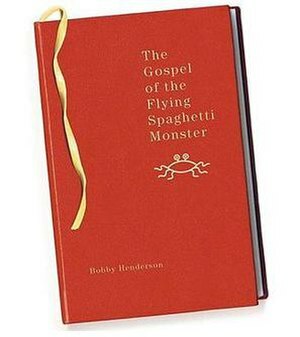 The first correct answer, gets the one coveted “The Gospel of the Flying Spaghetti Monster” that I could afford on the massive budget for the site! What is Russell's Teapot? Hint...Look in Archives! I will contact the winner via e-mail to get contact information. I love presents / prizes or whatever that comes wrapped in pretty wrapping paper! Congratulations to you on your 500th post!! I started blogging in 2003 or there abouts, but moved from one blog to another, though I doubt I’ve reached 500!! BTW, I did check your archives…so would that be you want the full answer and if so can I copy and paste it? It’s one long paragraph though!! A summary would be fine! 2003. Wow. That’s AWESOME! Good for you. 🙂 Dedication. Next PostNext What is the one thing that I HATE about birthday parties?